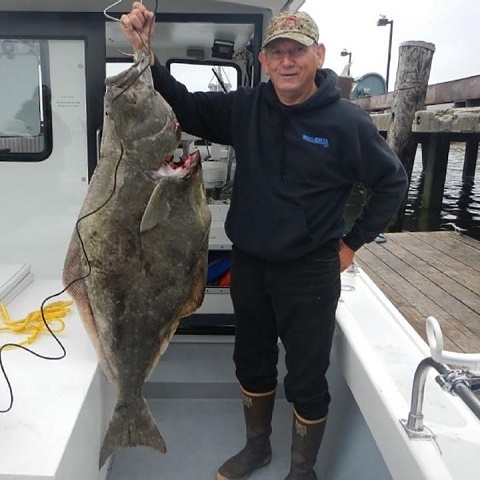 Bob Stewart of Eureka landed this 65 pound Pacific halibut last Thursday off the coast of Eureka. North Coast offshore adventures will be limited to just rockfish come Saturday morning as the California Department of Fish and Wildlife announced on Wednesday the closing of the recreational Pacific halibut fishery on Saturday, Sept. 24 at 12:01 a.m. for the remainder of the 2016 season. The quota of 29,640 pounds will be surpassed according to CDFW unless the fishery is closed based on the latest catch projections. Beginning in 2015, CDFW committed to in-season tracking of the fishery to ensure catch amounts would not exceed the California quota. The quota amount is determined annually in January through an international process, and is largely driven by results from the annual stock assessment conducted by the International Pacific Halibut Commission (IPHC). The Trinidad Pier Youth Fishing Tourney will take place on Sunday, Sept 25 from 1 p.m. to 3:00 p.m. The free event is open to all children ages 6 to 15. Prizes will be awarded in each category and fishing gear and bait will be provided. An adult must accompany children. Hot dogs and refreshments will be served following the event. Catch and release is encouraged and no fishing license is required. Look for the sign up table on the Trinidad Pier. 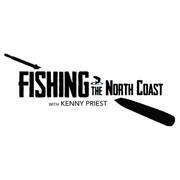 For more information, contact Ken Jones at kenjones@pierfishing.com. After a few days of sloppy weather, the ocean looks to be lying down just in time for the weekend. Friday, the last day of the Pacific halibut season, looks plenty fishable with winds out of the NE 5 to 10 knots and NW swells 2 feet at 4 seconds and NW 5 feet at 14 seconds. Saturday’s forecast is calling for winds 5 to 10 knots and NW swells 3 feet at 6 seconds and NW 7 feet at 12 seconds. Sunday the winds will be from the N 5 to 10 knots, with swells 4 feet at 7 seconds and NW 4 feet at 12 seconds. For an up-to-date weather forecast, visit weather.gov/eureka/. To monitor the latest Humboldt bar conditions, visit wrh.noaa.gov/eka/swan. You can also call the National Weather Service at 707-443-7062 or the office on Woodley Island at 707-443-6484. According to Sara Borok, Environmental Scientist on the Klamath River Project, the remaining quotas on the Upper Klamath and Trinity Rivers should remain open until sometime in October. “We haven’t had a lot of fish up river yet, so the effort has been fairly small. We should be able to go at least through the first week in Oct. for the Upper Klamath, and maybe longer. On the Trinity side, looking at the numbers, we’ll probably be able to keep it open to retention until late Oct. The mouth has been closing up regularly, but we should have some bigger tides now that will hopefully keep it open for good,” Borok added. Just a reminder, the lower Klamath quota for adult Chinook salmon has been met from the Hwy. 96 Bridge downriver to the ocean. The section is open to fishing, but salmon larger than 22 inches must be released. With salmon done and halibut closing after Friday, it’s just a rockfish show out of Eureka until the end of October. The weather wasn’t great earlier this week, so there hasn’t been much happening. Tim Klassen of Reel Steel Sport Fishing ran a few halibut trips last weekend and reported a pretty decent bite. 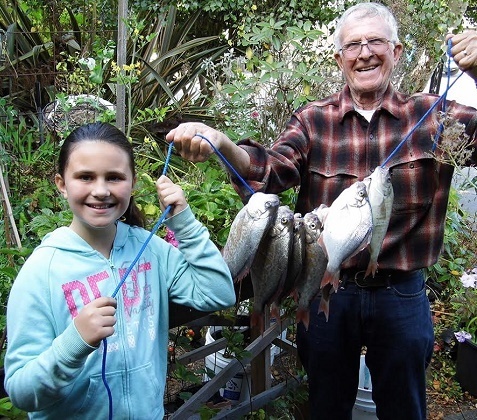 “There were some halibut caught over the weekend, but not everyone caught fish. The rockfish bite at the Cape remains phenomenal when you can get down there,” Klassen added. The mouth was plugged up over the weekend, but its open now and more fish are moving in reports guide Mike Coopman of Mike Coopman’s Guide Service. “It opened up on Monday night, and there’s definitely more fish in the system now. Overall, boats are averaging about five to six hook-up on kings per day. There’s also quite a few adult steelhead around as well as half-pounders,” Coopman added.